If your little one is looking for an exciting jungle challenge this wonderful Animal Rescue Sorting Truck from Melissa & Doug is going to be an all time favourite. A striking Safari rescue vehicle with moving wheels and two removable Park Rangers, this fantastic set also contains jungle animal pieces that fit into the die cut slots on the side of the truck. Just find the right entry point for the wooden alligator, zebra, rhinoceros, elephant, giraffe, hippopotamus and lion pieces, just like a puzzle, and you can load all the animals on board for rescuing. When everyone's inside, just lift the cargo door to unload - then count, sort and stack the solid-wood pieces. The Park rangers and the rugged jungle animals all stand up independently, so they're also great for savannah play when the sorting's done! 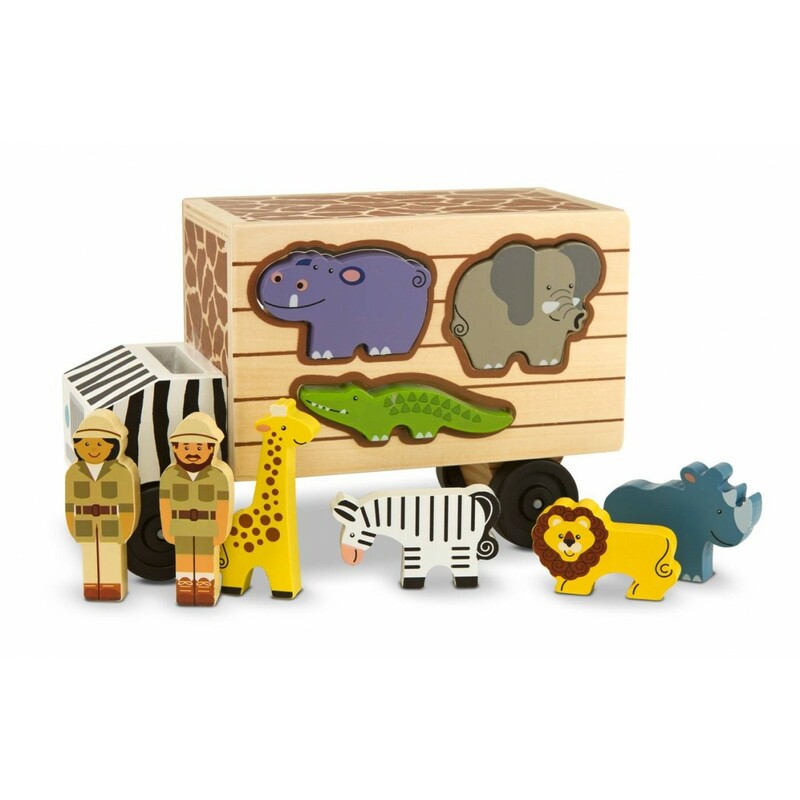 This is a set with lots of play value - it's a working safari truck, an animal puzzle and a multi-piece safari play set, all rolled into one great toy! The animals and Rangers really do stand up on their own, so they can be positioned any way your little one wants to make a stunning Safari scene. There's great educational quality to this very playable toy - the shape sorting and fill and spill aspects of the play experience are great for developing problem solving, hand/eye co-ordination and logic skills.